Hologlass displays allow businesses to exhibit the most modern, striking, and advanced digital signage available, using the customized software. The finished result is a sign that features content that suits your communication needs, most brilliantly to captivate your audience. 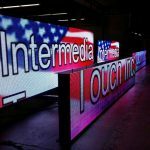 For all of your digital signage and custom hologlass signage needs, let Intermedia Touch be the name you trust. Captivate your audience: Hologlass allows you to use the latest technology to capture the attention of your visitors, guests, and employees in a beautiful, communicative manner. Added convenience with a touchscreen: Provide a unique and engaging touch-screen experience that enables customers to access information easily at their fingertips. 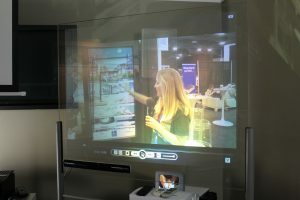 An advanced approach to marketing content: Hologlass is one of the most cutting-edge approaches to digital signage in existence. It is both eye-catching and captivating, and because so few companies offer it, it enables you to have an exclusively dramatic display. Informational data: Hologlass is a brilliant tool for displaying informational data for your guests and customers. Because the content is customized, you can alter your data presentations as needed. Customizable, versatile software: Hologlass can work in conjunction with any PC or MAC, along with any content you wish to present. 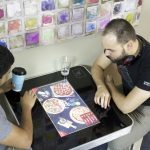 Options to rent or own: Hologlass is available for rent or purchase, depending on your needs. Custom sizes are available: Your sign can be created to fit your needs precisely, from 20″ to 108″ inches. Interactive signage displays are best for its ability to analyse. Making it more profitable than other mediums.